There are many other Utility/Combat knives that I suspect that Australian Service Personel used during WW2; finding evidence of them has proven difficult. The Mark 2 is a very sturdy knife. It weighs about 20 ounces, its overall length is 12 inches with a blade length of 7 inches by 1 1/4 inches deep with a stacked leather handle. Knives used by Australian servicemen would have been aquired from US personnel. A fine example of the early Mark 2 Combat/Utility knife with the blued blade from the Union Cutlery Company branded KABAR. Later production knives were the Parkerised finish. This image is in the archives of the Museum of the Australian War Memorial. 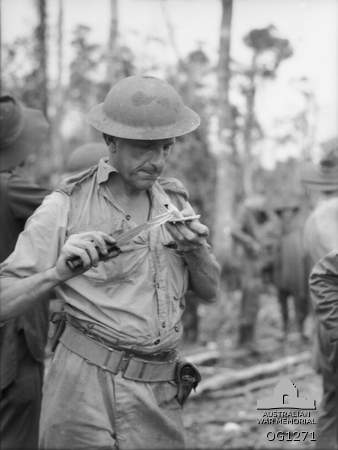 It was taken at Noemfoor Island, Dutch New Guinea on 2 July 1944 and shows Flight Lieutenant G. J. MCGuire, RAAF, preparing his lunch with a Mark 2 Combat/Utility knife.